Each country should hold dialogue with neighbors, Ali Hasanov, Azerbaijani president’s assistant for public and political affairs, said Oct.20. He made the remarks at a conference held at the University of Erciyes in the Turkish city of Kayseri. He noted that Azerbaijan is pursuing a policy of peace and cooperation in the region. "Of course, there are certain principles. Each country should respect the rights of another state, the rights of another nation, the territorial integrity of another state, attributes, economic interests of the state, the mentality of the people. If you don’t want your mentality being encroached on, you must not encroach on the mentality of another state. If you don’t want your country’s territorial integrity violated, you must not make territorial claims against another country, if you don’t want your safety being threatened, you should not endanger the safety of another country. 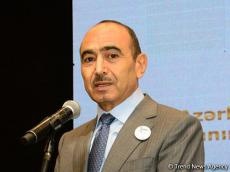 That is, a country not allowing for any attitude in respect of itself, should not allow itself to show the same attitude to other countries," Hasanov said. Ali Hasanov noted that there are conditions for building interstate relations in the world, which are reflected in the UN Charter. "These are non-interference in the internal affairs of another state, respect for its territorial integrity and sovereignty, resolving problems not by disputes, but by peaceful means, building relations of interstate cooperation, respecting human rights, creating conditions for free movement, migration of people and other issues,” he said. Ali Hasanov noted that there are also conditions agreed between the two countries and among several countries. “For example, there is a common cooperation platform such as Russia-Azerbaijan-Turkey, which is quite promising. There is a platform Russia-Iran-Azerbaijan, which operates in the fields of transport and communications. There are platforms for cooperation Iran-Turkey-Azerbaijan, Azerbaijan-Georgia-Turkey, Azerbaijan-Turkey-Georgia-Turkmenistan. All of them are platforms for regional dialogue. Countries have expressed their wishes and reached mutual understanding,” he said. Ali Hasanov said that it is a must to achieve mutual understanding for a dialogue. “There is a struggle for the existing energy resources all over the world. The powerful nations of the world are focused on safeguarding their interests, intending to get energy sources on more favorable terms, at a lower price and without competition. Other, not so strong countries that do not possess these sources, create alliances with other countries in order to get their share,” said Ali Hasanov.